It is the most highly decorated regiment of the Indian Army with a total of 1652 gallantry awards and honours including 2 Param Vir Chakras and 2 Ashok Chakras. The first battalion of the Sikh Regiment was raised on 1 August 1846 by the British East India Company. In 1979, this 1st battalion was the Commonwealth's most decorated battalion with 245 pre-independence and 82 post-independence gallantry awards. Later it was transformed into the 4th battalion, Mechanised Infantry Regiment. Currently, the Sikh Regimental Centre is located in Ramgarh Cantonment, Jharkhand. The Centre was earlier located in Meerut, Uttar Pradesh. Presently the Sikh Regiment consists of 19 battalions. Motto - Nischay Kar Apni Jeet Karon (With determination, I will be triumphant). War Cry - Jo Bole So Nihal, Sat Sri Akal (Victory belong to those; Who recite the name of God with a true Heart). The British Army wanted to raise Sikh Regiment for its Army but the idea was later abandoned fearing that this idea might be branded racist. The battle of Saragarhi was the one from where the legacy of Sikh regiment began. It was fought between Sikh soldiers of the British Indian Army and the Pashtun Orakzai tribesmen of Afghanistan in the North-West Frontier Province (now Khyber Pakhtunkhwa, Pakistan) on 12 September 1897. The British Indian contingent comprised of 21 Sikh soldiers of the 36th Sikhs (now the 4th battalion of the Sikh Regiment) who were attacked by around 10,000 Afghans. The Sikhs were led by Havildar Ishar Singh and they chose to fight till death. Even though all the Indian soldiers were killed, it is still regarded as one of the greatest last stands in the history. 180 Afghan soldiers were killed and 1000s of them were left wounded by just 21 Sikh soldiers. The present Sikh regiment celebrates its annual day on 12 September in the memory of this great battle. The Sikhs were nicknamed as the 'Lions of the Great War' after the war and 'Black Lions' during the World War 1. The Sikhs could be seen with traditional Sikh weapons such as chakrams and talwars and also with their holy book Guru Granth Sahib. More than 20% of the Indian soldiers(around 250,000 soldiers) in the British Indian Army were Sikhs. The most noticeable battle fought by Sikhs during this war was the Battle of La Bassee. This battle was fought between German and French-British forces. During the battle, the 47th Sikhs were part of a coordinated attack on the German fortifications. The attack was eventually cancelled, but two companies of the Sikhs never received the order and marched on the Germans themselves. During the attack the Sikhs lost 221 of their 289 soldiers but managed to severely cripple the Germans' attacking capabilities. The Sikhs were more involved in the Japanese campaign of the World War 2. The Sikhs made sure that the Japanese didn't advance through the Indian borders via Burma. The Sikhs also participated in the Italian campaign and helped the Allied forces in the invasion of Italy. Sikhs also fought the battle of Malaya in Singapore. 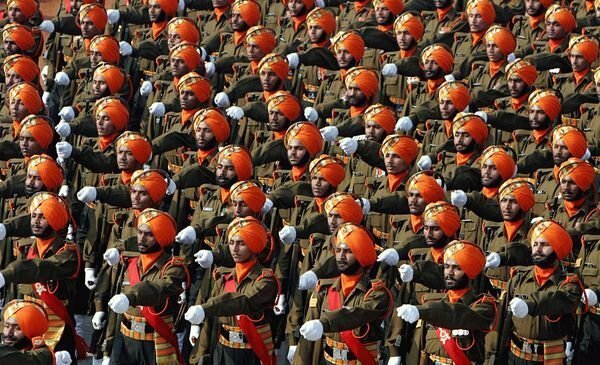 Post independence, Sikhs have fought in all the wars involving the Indian Army. Even though the Indo-China war of 1962 is not the greatest chapters in the history of Indian Army, the Sikh Regiment still stood out and the tales of the bravery of Subedar Joginder Singh, Captain Haripal Kaushik and Sepoy Kewal Singh still inspire us. The Sikh Regiment played a very crucial role in the cutting through the Pakistani territory and reaching the outskirts of Lahore. The 8th Sikh Regiment played a verry important role in the capture of Tiger Hill during the Kargil War. The Sikh Regiment has earned 1 Padma Vibhushan, 1 Padma Bhushan, 2 Param Vir Chakras, 2 Ashoka Chakras, 14 Maha Vir Chakras, 14 Kirti Chakras, 64 Vir Chakras, 15 Shaurya Chakras, 75 Sena Medals, 25 Vishisht Seva Medals and many other gallantry awards since Independence.